Extremely Rare Presentation of Bilateral but asymmetrical shoulder dislocation. Dept of orthopaedics , JIPMER , Puducherry – 605006. India. Dr Deep Sharma , Associate Prof, Associate Professor Dept of orthopaedics , JIPMER , Puducherry – 605006. India. Introduction: A bilateral shoulder dislocation is an extremely rare injury with only a few reported cases in English literature, and most of these cases have occurred following a seizure episode or an electric shock. We present the first ever reported case of simultaneous bilateral anterior and posterior fracture dislocation of shoulders and its unique mechanism of injury in a 48 year old diabetic male. Case Report: A 48 year old male presented to our emergency department with pain and restriction of movements involving both shoulders following a fall. The patient was standing by the side of a two wheeler when he had a sudden syncopal attack and toppled on the other side of the vehicle. On examination there was flattening of deltoid contour with a positive Dugas test in both sides. Humeral head was palpable posteriorly on the right side and anteriorly on the left side. Plain radiograph anteroposterior view of both shoulders showed posterior dislocation of right shoulder with a fracture of greater tuberosity and anterior dislocation of left shoulder with a greater tuberosity fracture. Closed reduction was achieved for both shoulders under general anaesthesia. After a couple of weeks, complete range of motion exercises was started. X-ray of bilateral shoulders, at 3 months, showed complete union of the fracture. Conclusion: Bilateral shoulder dislocation is suspected only following a violent mechanism of injury ,however, we would like to point out ,giving an example of our case that this injury may also occur after a trivial fall. And if associated with a fracture sometimes, the characteristic attitude of the limb may not be seen leading to a missed diagnosis. However a thorough clinical examination and the knowledge that such injuries may occur after a simple fall will help prevent missing these injuries. Keywords: Dislocation, shoulder, bilateral, asymmetrical, mode of injury. Shoulder is the most commonly dislocated joint following trauma, but a bilateral dislocation of shoulder is a rare occurrence, and usually follows severe involuntary contractions of the muscles around the shoulder and thus mostly presents following a violent seizure or electric shock . Usually these are posterior type but bilateral anterior dislocations have also been reported . However, a bilateral asymmetrical fracture dislocation occurring without such an episode of severe muscle spasm has not yet been reported in literature. And to the best of our knowledge this is the first such case to be ever reported. A 48 year old male presented to our emergency department with pain and restriction of movements involving both shoulders following a fall. A thorough history into the mechanism of fall revealed that the patient was a known diabetic on oral hypoglycaemic drugs and following a syncopal attack, he fell on his outstretched right hand with the body weight falling on it ,causing it to dislocate posteriorly. And a bystander in trying to prevent the patient from falling held on to his left upper limb, which was pulled into abduction, extension and external rotation producing an anterior dislocation on the left side . A detailed clinical examination showed flattening of deltoid contours on both sides. Humeral head was palpable posteriorly on the right side and anteriorly on the left side. Surprisingly, there were no characteristic deformities with the arms hanging by the side of the body. Attempted range of motion was painful on both sides. Plain radiograph anteroposterior view of both shoulders showed posterior dislocation of right shoulder with a fracture of greater tuberosity and anterior dislocation of left shoulder with a greater tuberosity fracture. Special radiographs including axillary lateral and scapular Y view were taken which confirmed the findings. He was not a known epileptic and did not give any history of a seizure episode in the past. He did not have any history of dislocation in the past. There were no features suggestive of generalized ligamentous laxity. A closed reduction was achieved for both shoulders under general anaesthesia, anterior dislocation was reduced easily by Kochers method ,and posterior was reduced by giving gentle traction on the arm in flexion and adduction ,with a direct pressure to the humeral head from behind ,but as the posterior dislocation was unstable, after reduction ,it was immobilised by spica in slight flexion and abduction with 20 degrees external rotation ,whereas a chest arm bandage was applied for the other side. Post reduction check X-ray showed concentric reduction of both shoulders with minimal displacement of fracture fragments. The spica and bandage were removed after 3 weeks and shoulder pendulum exercises were initiated. After a couple of weeks, complete range of motion exercises were started. 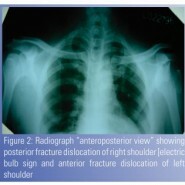 X-ray of bilateral shoulders, at 3 months, showed complete union of the fracture. Both the shoulders have satisfactory painless range of motion with no instability. Written informed consent was obtained from the patient for publication of his details in this report. Most often the shoulder joint dislocates anteriorly in 96.5% case, and posteriorly in only 3% cases, whereas an inferior dislocation is seen only in 0.5% cases of shoulder dislocation [1, 2, 3]. The rarity of the posterior dislocation can be explained by the presence of the strong scapular muscles posteriorly which support the joint and prevents it from dislocating posteriorly. However, as all these scapular muscles are attached to the proximal humerus, their uncontrolled severe spasm may lead to strong internal rotation of the head of the humerus because internal rotators are more powerful than the external rotators, and thus the head is pulled out of the glenoid, as happens following a seizure episode or electric shock. Thus, most of the posterior dislocations occur following such instances. However, a posterior dislocation may also occur after a fall on the outstretched hand if the limb is in an attitude of flexion adduction and internal rotation, as happened in our case. These posterior dislocations may go undiagnosed [4, 5] in the absence of a history of seizure and particularly when associated with an anterior dislocation on the opposite side . The characteristic presentation of a posterior dislocation of shoulder is flexion, adduction and internal rotation deformity while that of anterior dislocation is flexion, abduction and external rotation deformity. But, this typical presentation gets masked when there is an associated fracture involving the humeral head or glenoid. In our case, the patient presented with the arms hanging by the side of the body with no characteristic deformity. This emphasises the importance of careful clinical and radiological examination, lest the fracture dislocation could be easily missed. Bilateral simultaneous dislocations of the shoulder are very rare, and most often are posterior in type. Honner et al , described the largest series of bilateral posterior dislocations and most of these dislocations occurred following seizures. Bilateral anterior dislocations are even rarer and only 13 cases [7 – 17] have been reported so far. Even a case of bilateral inferior dislocation has been reported , but there are only 2 previous reports of an asymmetrical dislocation of bilateral shoulders [3,5] and only one case of a asymmetrical fracture dislocation shoulder that occurred following an electric shock  however our case exemplifies that such a violent mechanism may not always be required to produce these injuries. And eliciting the exact mechanism of fall, followed by a careful clinical and radiological examination can prevent one from missing out these injuries. Bilateral shoulder dislocation is suspected only following a violent mechanism of injury however this injury may also occur after a trivial fall. A thorough clinical examination and the knowledge that such injuries may occur after a simple fall will help prevent missing these injuries. 1. Canale ST. (2003): Campbell’s Operative Orthopaedics. 10th ed. 2. Kumar KS, O’Rourke S, Pillay JG. (2001) Hands up: a case of bilateral inferior shoulder dislocation. Emerg Med J. – 18(5), 414-415. 3. Fung DA, Menkowitz M, Chern K. (2008): Asymmetric Bilateral Shoulder Dislocation Involving a Luxatio Erecta Dislocation. Am J Orthop. – 37(5), E97-E98. 4. Elberger ST, Brody G. (1995): Bilateral posterior shoulder dislocations. Am J Emerg Med. – 13, 331-332. 5. 5 Galois L, Traversari R, Girard D, Mainard D, Delagoutte J. (2003): Asymmetrical bilateral shoulder dislocation. SICOT Online Rep. – Feb., E024. 6. Honner R. (1969): Bilateral posterior dislocation of the shoulder. Aust N Z J Surg. – 38, 269-272. 7. Devalia KL, Peter VK. (2005): Bilateral post traumatic anterior shoulder dislocation. J Postgrad Med. – 51(1),72-73. 8. Esenkaya I, Tuygun H, Türkmen IM. (2000) Bilateral anterior shoulder dislocation in a weight lifter (case report). Physician Sportsmed. – 28(3), 93-100. 9. Green P, Whittaker RP. Benign chondroblastoma: case reportwith pulmonary metastasis. J Bone Joint Surg Am1975;57:418–20. 10. Dinopoulos HT, Giannoudis PV, Smith RM, Matthews SJ. (1999): Bilateral anterior shoulder fracture-dislocation. A case report and a review of the literature. Int. Orthop. – 23, 128-130. 11. Dunlop CCR. (2002): Bilateral anterior shoulder dislocation. A case report and review of the literature. Acta Orthop Belg – 68,168-170. 12. Costigan PS, Binns MS, Wallace WA. (1990): Undiagnosed bilateral anterior dislocation of the shoulder. Injury 21: 409. 13. Singh, Sandeep; Kumar, Sudhir. (2005): European journal of emergency medicine 12(1): 33-35, Feb. 2005. 14. Suryavanshib A, Mittal A, Dongre S, Kashyap N. Bilateral Anterior Shoulder Dislocation with Symmetrical Greater Tuberosity Fracture following Seizure. Journal of Orthopaedic Case Reports. 2012;2(1):28-31. 15. Sunku N, Kalaiah K, G. Marulasidappa, P. Gopinath. Bilateral Anterior Fracture-Dislocation of Shoulder Joint. 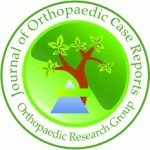 Journal of Orthopaedic Case Reports 2012 Oct – Dec ;2(4):7-9. 17. Patil MN. A Case of Simultaneous Bilateral Anterior Shoulder Dislocation. Journal of Orthopaedic Case Reports 2013 April-June;3(2):35-37. 18. Ozer H, Baltaci G, Selek H, Turanli S. (2005): Opposite-direction bilateral fracture dislocation of the shoulders after an electric shock. Arch Orthop Trauma Surg. – sep;125(7),499-502.